PHUKET: Local pig farms as far afield as Krabi are being checked for any signs of African Swine Fever (ASF) after a Chinese tourist was caught last week bringing sausages into the country that were carrying the virus. The sausages were seized from a Chinese tourist who flew from Chengdu, the capital of China's south-western Sichuan Province, to Phuket International Airport, last Wednesday (Jan 16). Tests conducted confirmed the presence of ASF, said Sorawit Thaneto, Director-General of the Department of Livestock Development, earlier this week. Phuket Livestock Office Acting Chief Manat Thepparat confirmed to The Phuket News that the contaminated sausages had been destroyed by officers at the Animal Quarantine Station at the airport. 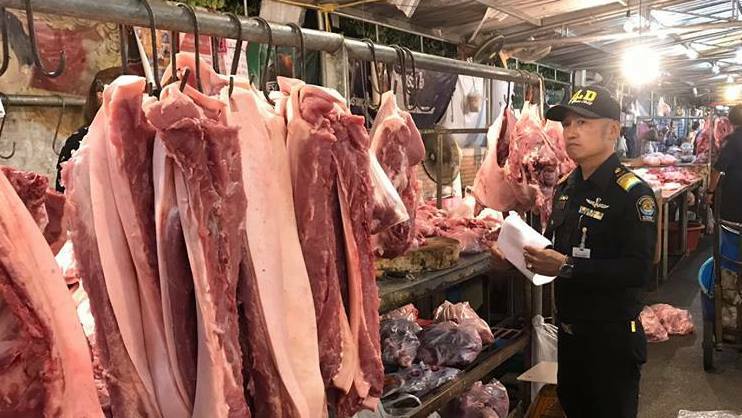 "Now, provincial livestock officials have started to check pig farms in the area, including as far away as Krabi," he said. "We will inspect all cold-storage units at farms and meat distribution centres on the island in February," he added. “I do not think that the virus has spread here, at this stage it has only been confirmed found at the airport, but I do worry about farmers who have pig farms. If the virus is found, all the pigs must be destroyed," Mr Manat explained. The World Organisation for Animal Health describes African swine fever as a severe, highly contagious haemorrhagic viral disease affecting domestic and wild pigs. "It is responsible for serious production and economic losses," the agency notes. François Roger, an epidemiologist with French agricultural research organisation CIRAD, in September last year voiced grave consequences for an outbreak of ASF out of China. In just one month last year, China saw ASF outbreaks in six provinces. "African swine fever (ASF) has been seen in Chinese pigs since early August. The epidemic reeks of economic catastrophe, given that the country accounts for more than half the world's pigs and ASF is one of the most contagious animal diseases, albeit, of course, harmless to humans," Mr Roger wrote.